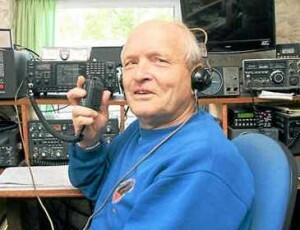 The history of the great hobby of Amateur Radio is a fascinating one. It is a story of early pioneering spirit peppered with a spicing of intrigue and even conflict! It is this subject that we are going to be visiting this week at Wythall Radio Club. Our national society, the RSGB, has put together a set of presentations for local clubs like our own to give. These look at the early days of Amateur Radio in the UK and how the RSGB itself came into being. Over the next few months we will be seeing all 4 of these presentations which cover a variety of subject matter. 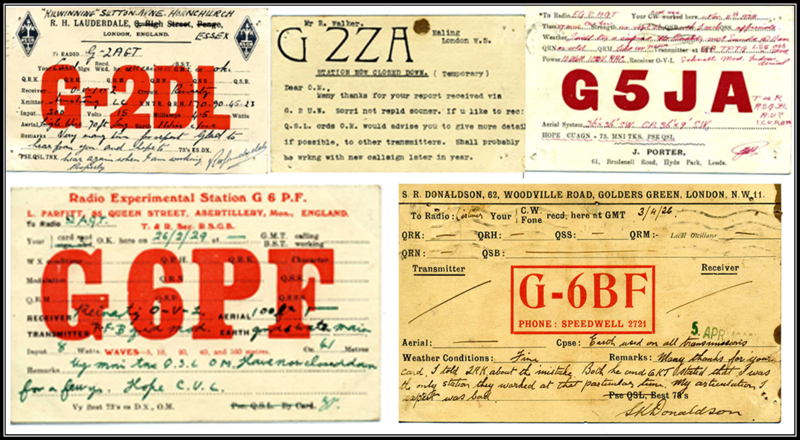 Some of the earliest QSL cards! 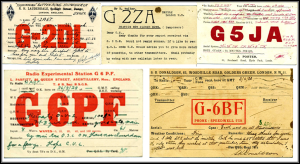 Later in the year we will be looking at the first Transatlantic radio tests, the role of Amateurs in the World Wars and at the variety of Antenna Experiments that took place in the early days. This Tuesday however sees the first in the series, which takes us back to the earliest days of Radio and sets the scene for the talks to come. Visitors are welcome of course, so if you would like to come along, head for Wythall House on Silver Street, B47 6LZ this Tuesday. The presentation starts at 2030 in the Club Shack in the basement. See you there! Wythall Radio Club in RadCom again! As the May edition of the Radio Society of Great Britain‘s monthly journal RadCom starts to drop into mailboxes around the world, it is pleasing to note Wythall Radio Club making a little bit of a splash here and there in this edition. 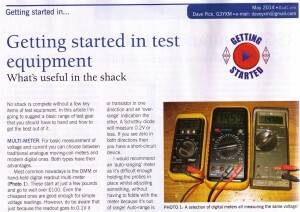 Club stalwart Dave G3YXM has written a 4 page article on page 32 entitled “Getting Started in Test Equipment” – and an excellently authored piece it is too! In the Sport Radio column on page 73, it is pleasing to see Wythall’s name mentioned in the breakout box for our achievements in the 160m Club Calls Contest as part of the Affiliated Societies Super League. And then in the regional news on page 84, there is an article about some of our recent exam successes. 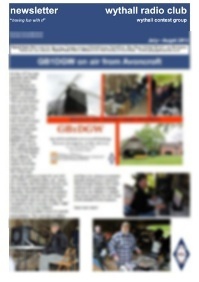 All in all a good read this month, especially for Wythall members! 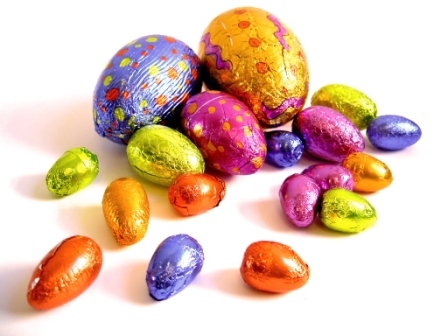 If you are tune around the 2 metre band in the West Midlands area between Maundy Thursday morning & Easter Monday night and hear some stations exchanging numbers, you might just have stumbled upon the 2014 Wythall Radio Club Easter Contest! Just as at Christmas, we hold an event to get our members on air and working each other. Points are given for each member contacted – each discrete member worked across the period also counts as a multiplying factor (or multiplier) to attain a final score. It sounds complicated but we have a clever Excel spreadsheet which keeps score for us! Just to ease the complication, tomorrow (Tuesday 14th April) we will have an evening where we can explain the idiosyncrasies of this annual event. Chris G7DDN will attempt to simplify the rules and the logging so that everyone can feel comfortable in taking part. 2030 in the Club Shack at Wythall House, Silver Street. B47 6LZ. Incidentally, the prizes for the contest are Easter Eggs – is it no wonder so many Wythall RC members are getting ever larger? The Radio Society of Great Britain announced today that they have appointed a new Regional Manager for Wythall Radio Club’s region. Following a ballot of members across the area, Martyn Vincent G3UKV was duly elected to serve the Society. The members of Wythall Radio Club would like to congratulate Martyn on his appointment. 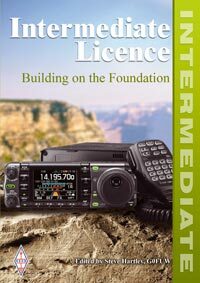 Further to our post earlier this week advertising the Intermediate Course starting next month, Wythall Radio Club is at the same time pleased and saddened to let you know that it is now full! We can only accommodate 7 students on a course like this due to space required for practical work and we have had 7 students sign up very quickly. Perhaps you can persuade him to run another course later this year! Some exciting news from the Wythall Radio Club Training Department today! We will be running a 9 week course for the Intermediate Licence starting next month. The course will begin on Monday 12th May and continue most Mondays until the start of July. As usual, we will hold the training at our Club headquarters at Wythall House on Silver St, postcode B47 6LZ . All sessions are from 20:00 and last for 2 hours. There is also an additional Saturday session on 14th June. This is for the practical assessments, which are compulsory, so you should ensure you can make that morning. The cost for this this course is £50 all in (no hidden extras!). If you are a Foundation License holder and would be interested in finding out more, click here for more information or email the Wythall Radio Club Training Co-ordinator Chris G0EYO. He is available (24/7 so it sometimes appears!) at [email protected].